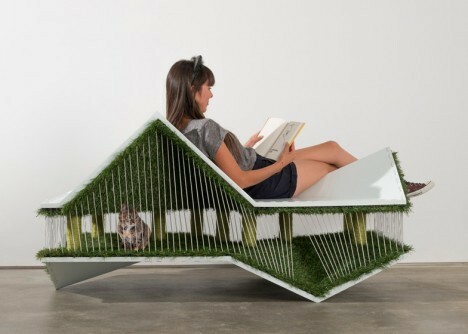 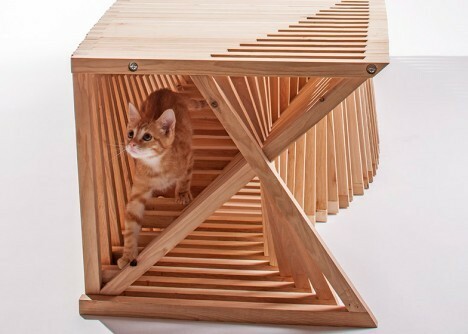 We don’t own our cats, they own us – and these fun feline furniture designs celebrate their rightful places in our homes. 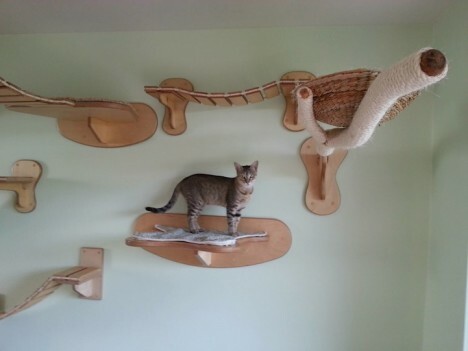 That is, sneering down at us from elevated perches on the walls and ceiling, as is befitting of their status. 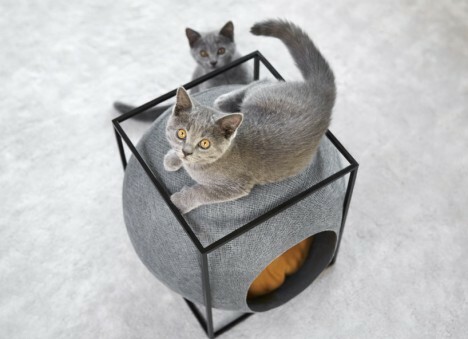 From modern cat beds that look right at home beside Arne Jacobsen chairs and modular cardboard box play sets to entire custom habitats built into their humans’ houses, these cool cat-centric products go way beyond what you’ll find at your local pet store. 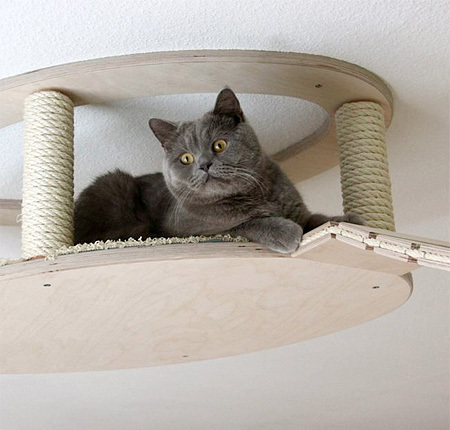 Our feline overlords can literally look down upon us from their elevated perches in this series of wall- and ceiling-mounted cat furniture by Goldtatze. 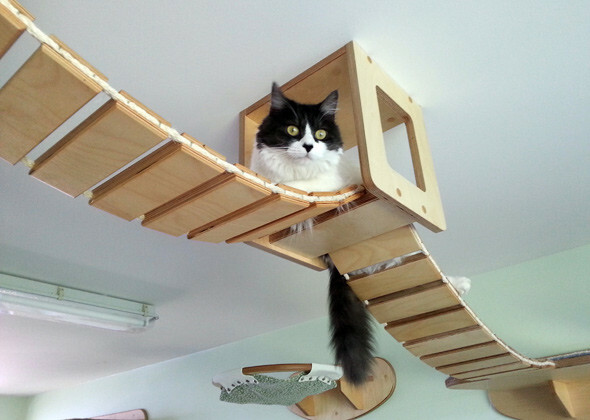 German company Goldtatze designs modular elements that can be combined in various ways to create unique feline playgrounds with bridges, hammocks, scratching posts, beds and little covered houses with holes so they can stay hidden while silently judging you from above. 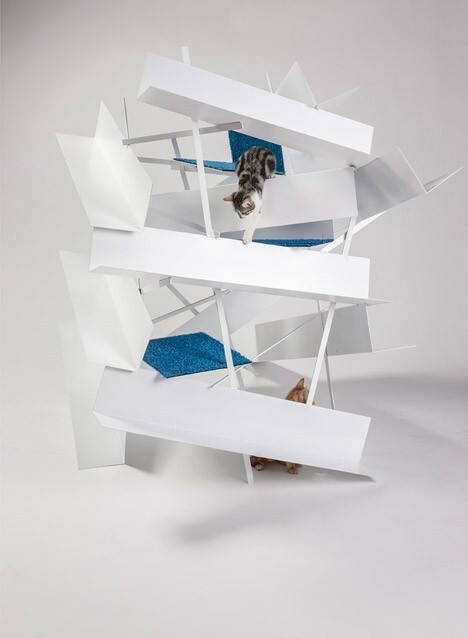 A group of architects teamed up to produce sculptural modern cat furniture for the Giving Shelter fundraiser, which donated its proceeds to the non-profit, cat-focused organization FixNation. 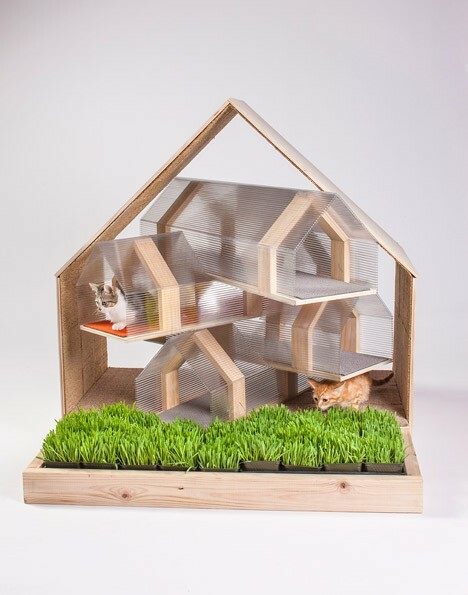 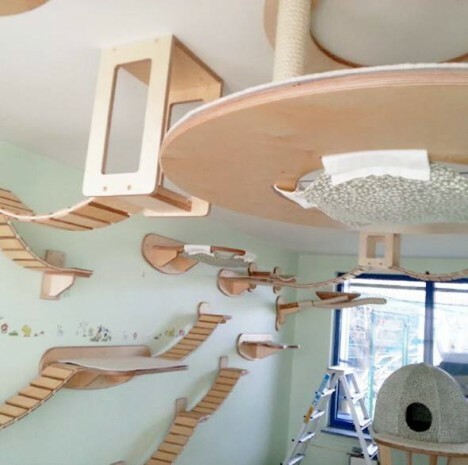 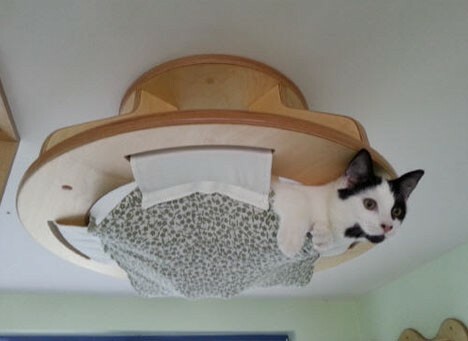 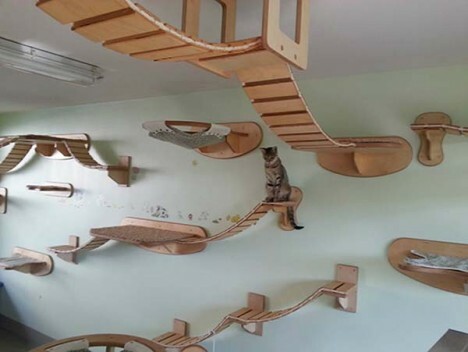 The same attention to detail that you’d see in a human house was applied to these structures , many of which combine cat comfort with functionality for their human owners. 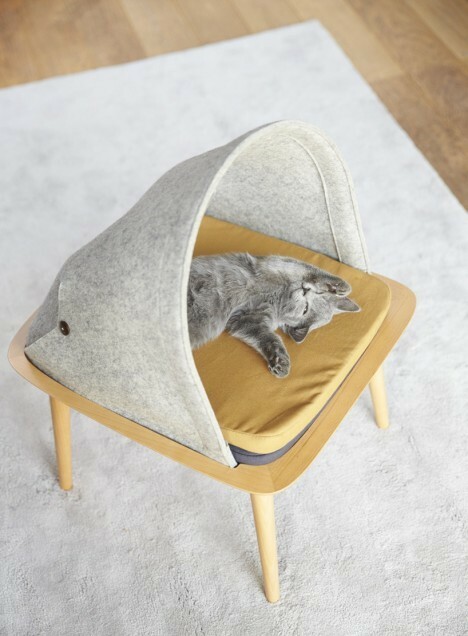 For everyone who’s ever lamented the gaudy cat bed selection at a local pet store, there’s Meyou, a line of modern minimalist cat furniture by Parisian designer Aude Sanchez. 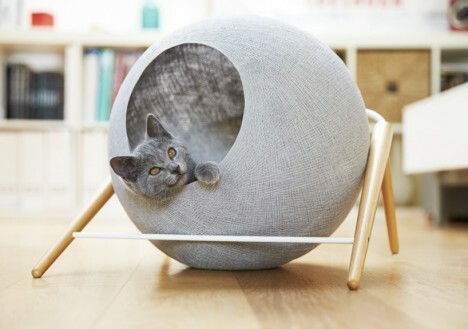 These cocoon-like beds feature spherical, replaceable inserts that allow cats to scratch the temptingly nubbly surface to their hearts’ content. 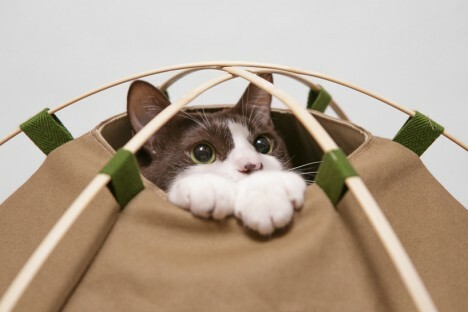 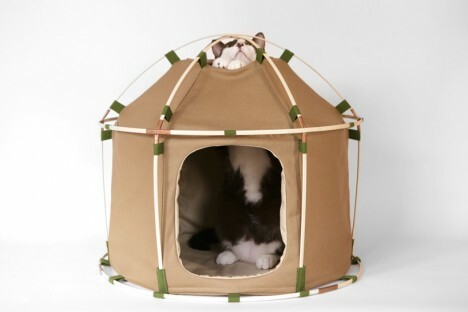 Give your kitty (or small dog) her very own tent with Cat Study House, a portable yet sturdy little shelter made from canvas, a bamboo framework and joints made of copper and acrylic. 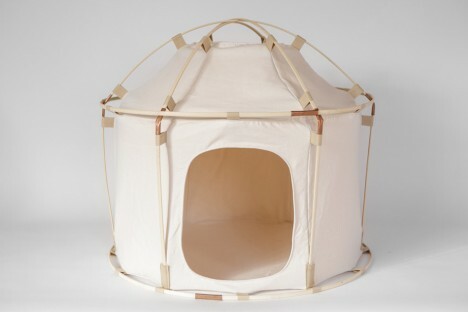 It’s lightweight, washable and features a little porthole at the top so your pets can keep an eye on you.